Most new houses are built by a general contractor who, among other things, obtains a building permit, orders materials, hires subcontractors to do the labor, schedules and coordinates the various steps in construction. He does not need to perform any actual labor, nor does he need to possess any particular trade skills – and that is why you can build a house yourself! If you have even modest ability to plan and organize a few tasks, and to keep a few records, you have all the skills you need to build a house yourself. General contractors must be licensed by a city, county, and state because they are either building a house for hire or building it to sell. But because you are building a house to live in yourself, you should face no licensing requirement. You should, however, verify this with your local building inspector before committing to the project. After pre-construction tasks are completed and building permit is obtained, expect the entire project to take anywhere from four to eight months. The size of the house and complexity of design will determine this more than any other factor. Negotiating skills, communication skills, and overall people skills are helpful, but by no means mandatory. If you don’t have an abundance of these qualities yet, don’t worry. You’ll acquire them as you go along. I know that I did. I was a different − and smarter person − at the completion of my first house, and you will be too. 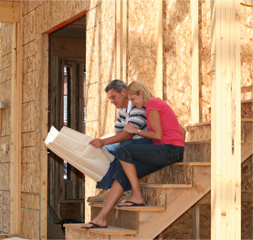 Building a house is one of the best real world education experiences you can ever have − and there’s no final exam. As with any first time project, it’s impossible to anticipate everything that you will have to do. But don’t worry about that. There’s a natural learning curve that will be made so much easier by what you find in this website. In twenty years of building, I’ve just about seen it all. What I’ve learned the hard way over the years will be a great benefit to you now. I’ve attempted to personalize the site as much as possible, based on my own experience. The most common question that the first-time house builder faces − and it’s a question that repeats again and again …..
Because of this website − and in particular the building schedule that I provide − you'll always have answers to that question, as well as so many others. So now it’s time to be all that you can be, because building a house isn’t just a job, it’s an adventure. You’re about to become one of the few, the proud, the house builders. Good info. Hope to see more!